Frankie Heck is a superhero. Well, no, not an actual superhero--but sometimes it seems to Frankie as though getting her kids out the door for school every morning is a superheroic act. Middle aged, middle class and living in the middle of the country, this harried wife and working mother of three uses her wry wit and sense of humor to try to get her family through each day intact. Frankie has a job (not a career) selling cars at the town's only surviving car dealer; her husband, Mike, is a manager at the local quarry. In between juggling shifts and picking up fast food dinners eaten in front of the TV, Frankie and Mike raise their kids with love and solid Midwestern practicality. Axl is the oldest, a teenage jock who is eating the family out of house and home and walks around in his underwear. Then there's Sue, their extraordinarily ordinary pre-teen daughter who fails at everything with great gusto. Brick, the youngest son, is an odd kid whose best friend is his backpack. Together, they're putting The Middle on the map. Great price. We love this show at ours - can identify with the Hecks which is rather sad I suppose. Superb show - heat added! Our favourite show. so funny! Top show...glad 'Debra' has finally found a hit after Everybody Loves Raymond. Underrated, funny show - heat! LOVE The Middle. Proper family life - :)Heat added. Yep, OOS when you get to checkout. Heated before expiring though! Sue Heck is one of the best sitcom characters ever. is this coming out on blu ray? its back in stock, have just ordered a copy to be delivered to my local branch by later tomorrow afternoon. I hate Patricia Heaton and I still love this show. Good show. 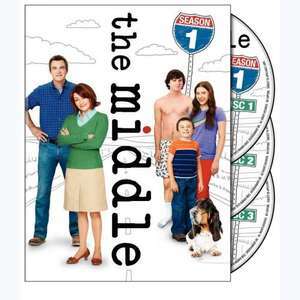 Not quiet as good as Malcolm in the middle but a really good show everyone in the family can relate too! Just a rip-off of Malcolm In the Middle but not as funny, cheap price though. Anyone know when the current season returns on Sky 1 after it's xmas/new year break? lol on the asda site description; what's a 'comdey'?